William Barber (May 2, 1807 – August 31, 1879) was the fifth Chief Engraver of the United States Mint from 1869 until his death. He succeeded James B. Longacre in the position. Mr. Barber was born in London, England on May 2, 1807. He learned his profession from his father, John Barber, and was employed on silver plate work, after his emigration to the United States. He resided in Boston for 10 years and was variously employed in his line of work. His skill in this way came to the knowledge of Mr. Longacre, then Engraver of the Mint, and he secured his services as an assistant in 1865. On January 20, 1869, upon the death of Mr. Longacre, he was appointed by President Andrew Johnson as his successor, and continued in that position for the rest of his life. He fell ill in Atlantic City in the second half of August, 1879, and died at home on Ellsworth Street in Philadelphia on August 31. Besides much original work on pattern coins, he also produced over 40 medals, public and private. The work on all of them very creditable. When preparations were made to create a new denomination, the double dime (twenty-cent piece), William Barber and Philadelphia Mint Superintendent James Pollock knew that the design needed to be significantly different than the Liberty Seated design used on the quarter dollar. Barber designed a series of patterns that were designed to do just that, including the so-called "Sailor Head" and "Liberty at the Seashore" designs. He also created two different wreath designs and one shield design for the reverse. However, Mint Director H.R. 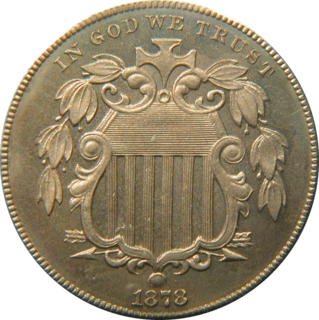 Linderman mandated that Barber instead use the Liberty Seated design with an eagle on the reverse, thus dooming the coin to failure. The double dime saw circulation only in 1875 and 1876, with proofs struck in 1877 and 1878. 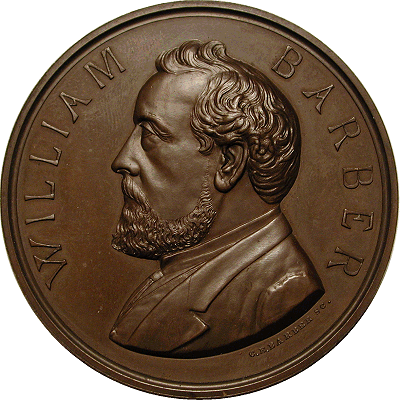 William Barber designed and engraved a number of medals. Among them are the 1869 "broken column" medalet (mini medal) remembering Lincoln's assassination, the popular 1869 Pacific Railroad medal, the even more popular 1876 Centennial medal, and the second Ulysses S. Grant Inaugural medal. What most people don't know is that William Barber designed what would have been the first U.S. commemorative coin, had it ever been made. Original sketches of a Liberty head quarter dollar were to commemorate the beginning of the nation's second century. Unfortunately, the beautiful design didn't overcome lack of interest in the idea for the coin, and it never made it to the pattern stage. Barber was also a prolific pattern designer, and for a time engaged in a "pattern war" with fellow coin designer and future Chief Engraver George T. Morgan. There were numerous pattern designs for "Standard" coinage soon after he became the chief engraver. The only part of this idea that became reality was a standardized "Commercial" dollar which eventually became the Trade dollar. The high watermark of his pattern work was the beautiful so-called "Amazonian" pattern coinage of 1872. Made for both silver and gold denominations, today they are some of the most prized and valuable of collectible patterns. In 1876, following the failure of the double dime, tension developed between William Barber and the Mint Director. Linderman wanted some new blood in the Engraving department. It isn't known whether this was a result of the debacle of the twenty-cent piece or if Linderman simply wanted new talent. Regardless of the reason, Linderman hired George T. Morgan from England for the Engraving Department. However, he did this rather behind the back of the Chief Engraver. To make matters worse, when Morgan arrived in Philadelphia, Linderman specified the new arrival would report to himself in Washington, not to the Chief Engraver as was the normal practice. This management decision by Linderman resulted in difficulties of Morgan fitting in with William Barber, the Engraving department, and Mint Superintendent James Pollock. While there was an uneasy relationship between William Barber and George Morgan, the main hostility was between Barber and Linderman. Whereas, by the sovereign will of God, Mr. William Barber, Engraver of the Mint, has been removed by death, and we, the Officers, Clerks, and Workmen, have met to express our sentiments and sympathy on this sad and solemn occasion. Resolved, that we sympathize with his family in their bereavement, and present them with a copy of these proceedings, signed by the Officers of the meeting. Following William's death, several of the assistant engravers wanted the top job, including Charles Barber, George Morgan, and others. After a number of months of deliberation, President Rutherford B. Hayes made the decision, and Charles Barber succeeded his father as Chief Engraver on January 20, 1880. William married Anna Maria (Anna May) and had four children. Son Charles E. Barber is well known. William and Anna May also had another son, named Harry, apparently younger than Charles. They also had two daughters, Florence (died July 1900) and Mary (died June 1913). Anna May Barber died on October 28, 1880, a little more than a year after her husband. William and Anna May Barber, along with their two daughters, are buried in Mount Moriah Cemetery, on Cobbs Creek Parkway in Philadelphia. There are no known photographs of William Barber. Until a painting of a young William Barber (c. 1840s) was found in the possession of the family, the only known image of William was on an 1880 medal commemorating the engraver, executed by his son, Charles. ^ a b c d Whisker, "Barber, William". ^ "Obituary - William Barber". Philadelphia Inquirer. September 3, 1879. ^ Brunner, Lane; Frost, John (2014). Double Dimes - the United States Twenty-cent Piece. ^ a b c d e Frost, John (Summer 2018). "In Search of the Forgotten Liberty Seated Engraver William Barber". Gobrecht Journal - Liberty Seated Collectors Club. 44 #2: 5–16. ^ a b c d e Frost, John (August 2018). The Numismatist. Reimagining the Barbers. American Numismatic Association. pp. 49–61. Cornelius Vermeule, Numismatic art in America : aesthetics of the United States coinage, Atlanta, Ga. : Whitman Pub., 2007. James B. Whisker, Pennsylvania workers in brass, copper and tin : 1681-1900, Lewiston, N.Y. : Edwin Mellen Press, 1993. The Morgan dollar was a United States dollar coin minted from 1878 to 1904, and again in 1921. It was the first standard silver dollar minted since production of the previous design, the Seated Liberty dollar, ceased due to the passage of the Coinage Act of 1873, which also ended the free coining of silver. The coin is named after its designer, United States Mint Assistant Engraver George T. Morgan. The obverse depicts a profile portrait representing Liberty, while the reverse depicts an eagle with wings outstretched. The mint mark, if any, appears on the reverse above the "o" in "Dollar".